Select an option... 12 Months ($170.10) 06 Months ($123.60) No, thank you. I will source my own insurance. 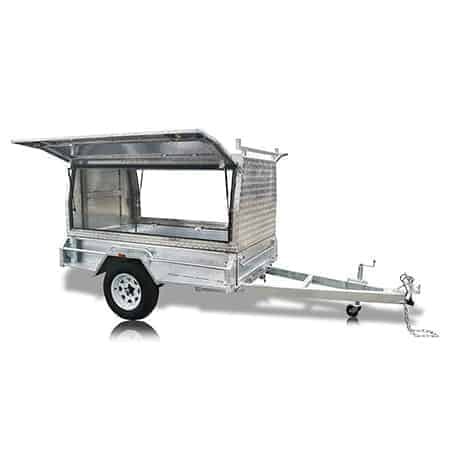 The 8 x 5 Tradesman trailer makes business a breeze. It sports a sleek and elemental design with stowage on the roof and plenty of storage inside the canopy! The Tradesman canopy is durable, functional and locally manufactured to support the local tradie. Tying bars on three sides lock down your roof load. The enclosed box keeps the valuable tools of your trade safe and sound. You can fit more in, and take it where you need it. Winged, top-hinged doors on both sides, gives you quick and easy access to all your material. The Tradesman trailers come with an optional wheel brace, internal shelving, and ladder racks to suit all purposes. Century Trailers do not compromise on quality in the design, production, or assembly of all our trailers. The 8 x 5 Tradesman is made from high quality, Australian standard components. Rubber-sealed doors keep your tools out of the elements so they last longer and stay useful. Our local factory, in Rocklea, repairs, replaces, and maintains all of our trailers, so you don’t lose precious time waiting to get back on the job. We involve ourselves in the entire supply chain, so our customer service agents consistently sell only the highest quality products. All our trailers are tested against the cruelest Australian conditions, so we know they can handle your load. With various sizes and load variations available, you can find a Tradesman trailer to suit your trading needs. You cannot go wrong with a 8 x 5 Tradesman trailer from Century Trailers!